My Dying Bride formed in the summer of 1990, and after only 6 months of writing together released the now legendary demo Towards The Sinister. Progress continued apace with the release of their first 7″ single God Is Alone for the small French label Listenable. The single sold out almost immediately causing eager whispers in the underground, bringing them to the attention of Peaceville Records, who offered the band a deal. The first release from this now infamous pairing was the EP Symphonaire Infernus Et Spera Empyrium, shortly followed by the band’s first full-length album As The Flower Withers, avant-garde doom metal was born. The band followed the release with a series of shows in the UK and mainland Europe. The response was phenomenal, and spurring the band on it wasn’t long before they were back in the studio recording their second EP The Thrash Of Naked Limbs. A full length tour of Europe was planned with sickodelic label mates G.G.F.H. but this was pulled at the last minute when MDB’s drummer Rick had a bad fall while making the accompanying video. The video was a huge success with the MTV metal hordes and the EP flew high into the Kerrang charts. Fans and critics hailed the band as pioneers of the new doom-gothic metal genre. Pushing these new boundaries even further MDB recruited long time session musician and classically trained violin and piano player Martin Powell as a full time member. Writing then begun in earnest for their second album Turn Loose The Swans, released in 1993 a huge European tour was planned to coincide with the release, the album received rave reviews and apart from illness, theft and motor breakdowns the tour was a huge success. In 94 the band kept up the flow by releasing the I Am The Bloody Earth EP, and then settled down to write material for their third album, The Angel And The Dark River. The album was released in 1995 and an opus was born. Six epic tracks, averaging around nine minutes each immersed the listener in MDB’s full sinister glory. By now the band were at the very forefront of the advanced metal scene, hailed in the press and with a flurry of like-minded bands following in their shadows, they again launched a successful live assault on Europe, culminating in some high profile festival appearances, including the famous Dynamo metal festival in Holland. 1995 was also the year that the band released Trinity a single CD compilation of the first 3 EP’s, if that wasn’t enough they were invited on the road by the mighty Iron Maiden. This saw 1995 rounded off nicely, the tour, a 3-month hike around Europe was awesome and saw MDB win over thousands of diehard Maiden fans every night. Still happily married to Peaceville, the band, always one step ahead, released their fourth album Like Gods of the Sun in 1996. Again a rich work of art. Experience and careful attention to detail resulted in a much cleaner sound. Sarnies n clean socks packed they toured Europe, this time with Cathedral. Demand being so great they did it all over again in 97 with Sentenced. 97 was also the year that saw MDB hotfoot it to the US, to support Dio. Being well versed in all things MDB the US crowds went loco. Alas, with only a few weeks of the tour left, the band had to pull out when Rick the drummer contracted a debilitating illness, which sadly resulted in the original member having to leave the band altogether. Help came in the form of Bill Law, drummer with label mates Dominion, and work got under way writing the fifth album, enigmatically titled 34.788% Complete. Encouraged by the success of the album the first ever MDB/Peaceville DVD was released in April 2002 – 2 ½ hours of material – including a stunning live performance from Krakow Poland – with plenty of extra live footage (more gigs) & a chance to peek at vocalist Aaron’s stunning collection of artwork. This was followed by MDB’s first ever LIVE CD – The Voice Of The Wretched, filmed at the now infamous Peacefest finale at the luxurious 013 Club in Tilburg, Holland in March 2001. Again the album received an amazing response from the media – garnering many 10/10-review scores. The band rounded off the year by playing all the European metal/alternative festivals, including Wacken, Gras Pop & Bos Pop. In 2003 MDB settled into work on their follow up to The Dreadful Hours. With plenty of ideas already formulated the band were keen to keep up momentum. In the summer of 03 My Dying Bride found themselves again at Academy with Mags in the production seat. The result of that recording session was the stunning Songs Of Darkness Words of Light LP, MDB’s eighth studio album. The album was released to huge press commendation in March 2004. The band played many live dates & festivals around Europe to promote the album. They also recorded their first promo video since ‘For You’ for the track Prize Of Beauty. At the end of 2004, My Dying Bride got together with artist & video director Dave Palser – they originally worked with Dave on the video ‘Cry Of Mankind’, always hailed as the best My Dying Bride video. Due to the success of the Prize Of Beauty, they decided to make a video with Dave for the Blue Lotus. The video was completed in early 2005 featured heavily on the metal music channels. Also in May 2005, the band released a three-CD box set: Anti – Diluvian Chronicles. This contains new re-workings of three classic My Dying Bride songs – My Wine In Silence, The Raven & The Rose & The Wreckage Of My Flesh; (Academy Studios 2005). This mammoth 29-song box set comes with a poster and a full and exclusive interview with the enigmatic front man Aaron – conducted by one of the UK\’s most enduring metal journalists, Dom Lawson of Kerrang! A great place to start if you’re just getting into the band. Not to mention highly collectable. September 2005 saw the release of My Dying Bride’s second long-form DVD entitled Sinamorata. Among the goodies on offer on the DVD is a full live concert performance, filmed @ Antwerp’s Hof Ter Lo venue in November of 2003. The two new promo videos, along with some videos shot by fans, more live concert footage and much more. The band had been kept busy writing material for the new album, but took time out in November 05 to play The Astoria, and also play their first home town gig in four years at Bradford Rios. The band entered Academy Studios in Spring 2006 to record the follow up to Songs Of Darkness, entitled A Line of Deathless Kings. Drums were handled by John Bennett of fellow Yorkshire doomsters, The Prophecy, and as always, longtime collaborator & producer Mags took control of engineering duties. The album was mixed at The Chapel in Lincolnshire and mastered at the infamous Abbey Road studios. The first single to be lifted from the album was called Deeper Down and preceded the album as a 4 track release. A promo video was also shot for Deeper Down by Charlie Granberg (who was responsible for the Katatonia videos My Twin & Deliberation). A fantastic response greeted the release of the album, with A Line of Deathless Kings ranking high on many publications top albums of the year. My Dying Bride continued their live work in support of the album, featuring at many festivals throughout Europe. In 2008, as the band composed and prepared to record tracks for their new album, Peaceville Records released An Ode to Woe, a live CD&DVD showing the band on fine form at the world famous Paradiso venue in Amsterdam in April 2007. The release was also an introduction for fans to new members Lena Abe on bass and Dan Mullins (ex-Bal Sagoth, Thine) on drums, both having recently joined My Dying Bride. Recording of the follow-up to A Line of Deathless Kings began in spring 2008 with work continuing through the Summer. In the meantime My Dying Bride made some extra special festival appearances with the re-introduction of violins, courtesy of new member Katie Stone – an unforeseen highlight for all fans who witnessed the shows, which was then followed by the uniting of the ‘Peaceville 3′(MDB, Anathema, Paradise Lost) for 2 special shows to celebrate the 20th anniversary of Paradise Lost. These took place in Paris & London and was an unforgettable occasion for many fans wishing for this lineup for many years. By this time, work on the album, titled ‘For Lies I Sire’ was almost fully completed, as the band had spent the previous months at work in Manchester with long-time MDB engineer/producer Mags. The album was released on 23rd March 2009 and was undoubtedly among the band’s very best work to date. The album was greatly received critically, & the band followed this up with the Bring Me Victory EP in late 2009, featuring the lead track taken from ‘For Lies I Sire’, plus the song video (once again by Charlie Granberg). Accompanying the track was a cover version of English medieval ballad ‘Scarborough Fair’, plus ‘Failure’ by cult group Swans. Rounding out the EP was a live rendition of ‘Vast Choirs’, recorded at the infamous Graspop festival. My Dying Bride had had a vision many years prior, of a series of symphonic & orchestral-based compositions taking inspiration from previous tracks by the band & being expanded into grandiose flowing soundscapes. The band therefore teamed up with Bal Sagoth’s Jonny Maudlin to assist in the construction of these songs, to be collectively titled Evinta, for a release to commemorate 20 years of the band. The results were immense, & a real treat for all My Dying Bride fans. Evinta saw light of day in May 2011, also marked by a short UK tour with Portugal’s Ava Inferi in support. It was at this point that the band had begun writing for the follow-up to For Lies I Sire, but by the middle of 2011, & never ones to be conventional, My Dying Bride began to construct a separate, completely epic piece of their trademark titanic doom metal spanning a length of over 20 minutes. Whilst this new song took form, plans for recording the full-length were delayed & the EP ‘The Barghest O’ Whitby’ was born. One song of 27 minutes, & a spellbinding journey through the realms of superstition & folklore, released November 2011, with artwork created by vocalist Aaron Stainthorpe. As ‘The Barghest…’ was unleashed upon the metal world, writing for the full-length gained momentum in a great creative period for the band. The new release was to be titled ‘A Map of all our Failures’ & with recording & mixing completed at Futureworks by the summer of 2012, the band had another masterwork on their hands, with some of their heaviest material to date firmly keeping them atop of the doom metal pecking order. The album was released October 15th. This was followed by the EP ‘The Manuscript’, containing tracks from the ‘Map…’ sessions. This release was subsequently compiled with ‘The Barghest o’ Whitby’ into ‘The Vaulted Shadows’. Not long after this time it was announced that Hamish Glencross was no longer part of the band, with My Dying Bride welcoming back original guitarist Calvin Robertshaw for what was sure to be among the band’s heaviest records to date. 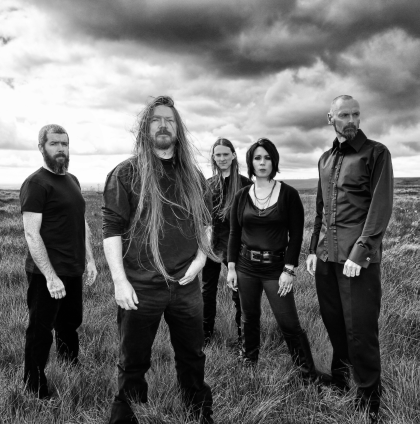 The band even returned to their old haunt of Academy Studios for recording of what was set to be My Dying Bride’s 12th full-length opus, ‘The Feel Misery’; also coinciding with the band’s 25th anniversary.